Here are the 9 questions every programmer and developer who aspires to be a freelancer has to ask to himself before one can embark on the journey of being a freelancer. Any business isn’t easy and so is the case with Freelancing. Do not consider freelancing a destination but it is the start of a new journey for a developer and programmer. So here are the 9 questions every programmer who aspires to be a freelancer has to ask himself before one can embark on the journey of being a freelancer. 1. Am I Fine Wearing Multiple Hats? As a developer working for an employer, you write code to create beautiful applications. However, as a freelancer one has to wear multiple hats. You may be writing code but also doing the marketing of your services, accounting, taxation, providing support via email/phone to clients etc. A freelance developer needs to be doing so much more than just writing the code. To wear those hats, one needs many non-programming skills like communication, negotiation, estimation etc. 2. How Can I Handle High Growth? One may assume it is easy to handle growth but believe me, it is not easy as it may sound. As a new freelancer, you may tend to take up projects in a new domain of expertise with the assumption that you have the time to learn. If in such a scenario you have few clients respond at the same time and now you have more clients than you can handle. There is very little one can do apart from the fact that one has to put his head down and finish up projects as soon as humanly possible. You won’t have the time to find someone who can work with you and you won’t have enough time to be able to deliver for each client. It is good to have a situation but it also means you will have to handle it with a lot of care. It shouldn’t let your reputation take a nosedive. A negative feedback on Upwork in a situation you always wanted to be as a freelancer isn’t good. 3. Can I handle LUL time? It can be time after the vacation where you deliberately didn’t take clients for some time but when you are back, chances are you will have time when you are not full blown to freelancing. Even the experienced of freelancers will have lul time in between projects. Whatever be the scenario, there will be a time when you have clients waiting and then there will be a time when you are actively looking for clients. When you have the time at hand, you can be drifted towards trying a lot of new marketing methods. As an example, social media marketing can fetch clients or Google Adwords is better off generating leads than SEO. The temptation will be high but make sure you do the right things the right way instead of experimenting just for the sake of experimenting. 4. Am I good at saying NO? If you wake up to work with emails from a client, you may be reactive to freelancing. If you are a good freelancer, clients will love to work with you in technologies they have ongoing projects. As a freelancer, one needs to make sure to take up only things that you want to be working in. If you don’t want to be working in a particular niche, you have to tell no to clients. I have clients who want me to be doing their XenForo designs but I let them know that I don’t do XenForo themes and designs. I make sure I say no to such work even from high paying long-term clients. Similarly, clients may want you to be working on weekends if you don’t let them know you don’t work on weekends. You have to set the expectations right. 5. How Bad I Want it? Do you want to be a freelancer because someone else is doing awesome as a freelancer or you just want don’t want to commute to work and want to be working from home? If you are motivated to be a freelancer because of others, you may be in it for the wrong reasons. You may be seeing the results after few years of hard work or after the crunch time. Be in love to be working whenever you want, wherever you want and with whomever you want. Other motivation to be a freelancer isn’t the right way forward. If you don’t want to be a freelancer really badly, there are chances that you will not make it happen. It isn’t easy to be a freelancer and it will never be any easier in the future than it is today either. 6. Whom can I Lookup to? Have someone whom you can look up to. The best person to look up to as a freelancer is among the top freelancers in your specific niche. What do they to get better clients? How are they creating their own freelancing niche? What kind of clients do they take up? Be in the freelancing mastermind groups on Facebook or be part of the online communities to follow someone to look up to. 7. Do I have a PLAN B? What if freelancing doesn’t work for you in a particular niche?Do you have a plan B? You can blog an alternate source to clients, or can switch over to a completely new niche or take up a part-time job while you try freelancing or find clients differently and not using freelancing sites like Upwork? Do you have an alternate plan for if things didn’t work out the way you expected them to? Upwork is one of the good sources of clients for me but I also have plan B even after being a freelancer for a decade which is building my blogs and forums as a source of clients. Too much dependency on one aspect to freelancing isn’t the right approach. As an individual freelancer, you are already a single point. So if your business relies on other single points, it is a recipe for catastrophe. 8. Can I go for it all Alone? What if at some point you are stuck. Do you have the analytical and debugging skills to fix things all alone? Of course, you have online to help but do you have the needed expertise to be able to figure it out? If you are a developer, can you find enough work without designing skills? Is it better to team up with someone else? Finding someone to team up is difficult but not impossible. Remember, someone somewhere is also looking to team up with you as well. So let everyone you know what you are up to and others may be willing to partner with you. Don’t wait for others to approach you. 9. Can I Do it? Finally, ask yourself, do you have it in you what it takes to be a freelancer? 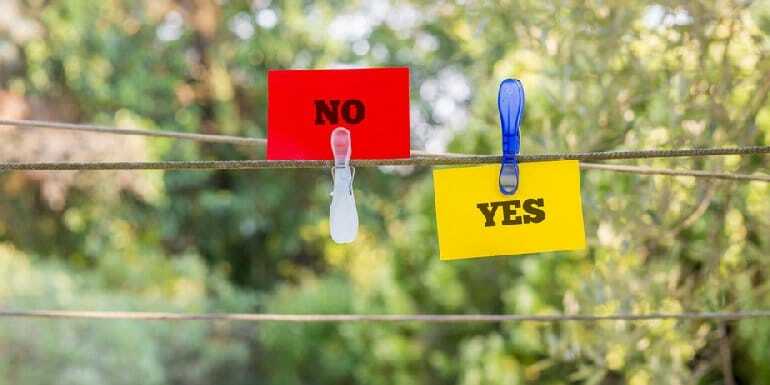 If the answer is a YES, even a slight YES, it is worth trying. Remember if you give it a try, there is nothing to lose. 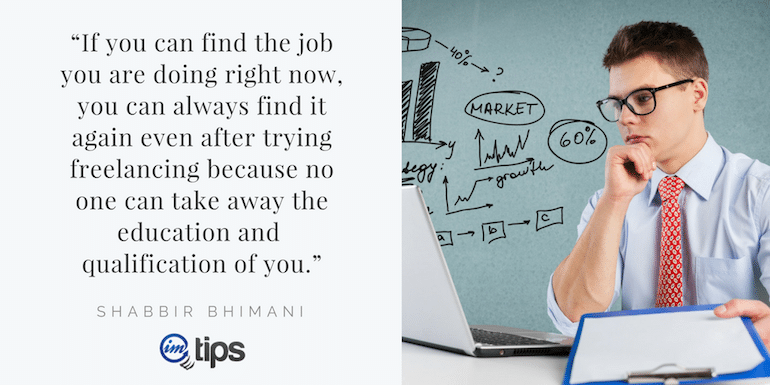 If you can find the job you are doing right now, you can always find it again even after trying freelancing because no one can take away the education and qualification of you. Do consider freelancing, even as part-time to see how it works out.